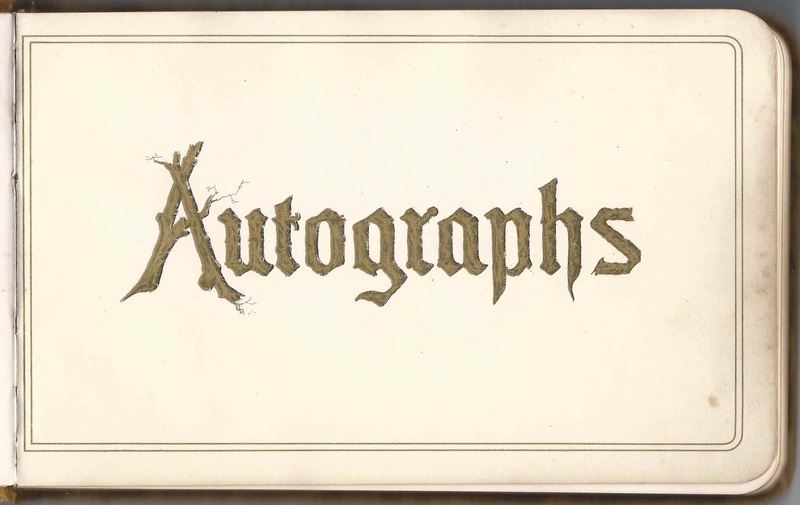 1880s autograph album that belonged to an Elsie, possibly from Ipswich, Massachusetts, the Boston area, or Baltimore, Maryland. Many of the signers had a connection to the Appleton and Heard families of Ipswich, Massachusetts. Hopefully a reader can tease out Elsie's identity. The album was purchased with an 1867 diary from the Newbury, Massachusetts, area, filled mostly with laconic weather observations by its farmer owner. The album measures approximately 8" x 5" and contains the sentiments of 35 of Elsie's friends. An alphabetical list of the signers, with residence information, appears at the end of this post. In the event that Elsie lived at Ipswich, I found an Elsie M. Cartledge, daughter of William and Ellen (Jarvis) Cartledge. She would marry Charles E. Goodhue, son of William and Caroline (Bill) Goodhue, at Ipswich, Massachusetts, on May 29, 1893. However, this Elsie was probably a tad too young. Many of the signers had a connection to Appleton Farms at Ipswich, Massachusetts, which was founded by Samuel Appleton in 1636, carried on for well over 300 years by members of the Appleton family and operated today by the Trustees of Reservations. 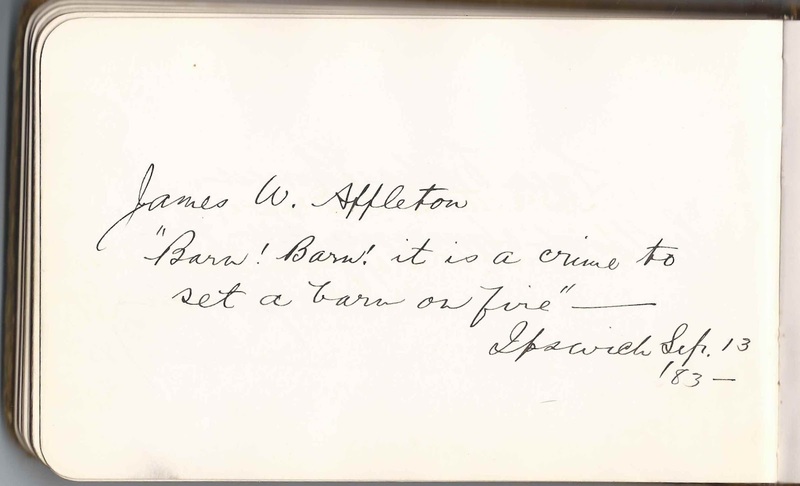 Among the signers is James W. Appleton, who signed his page at Ipswich, Massachusetts, on September 13, 1883. He wasn't the only signer to mention a fire; there must be a story there! Henrietta Greenleaf Woods Smith, daughter of Rev. 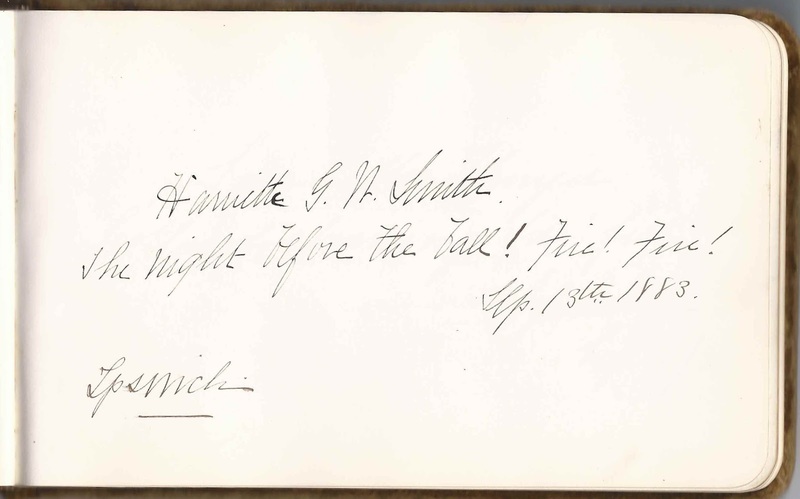 John Cotton Smith and Harriet Hooper (Appleton) Smith signed two pages, one on July 7, 1882 at Briar Hill, Ipswich, Massachusetts, and one on September 13, 1883 at Ipswich, Massachusetts. The Briar Hill House at Appleton Farms was the Smith family's summer home. Read more about the Briar Hill House here. Other signers were members of the Heard family of Ipswich, Massachusetts. Harvard Business School had an exhibit, still available online, on this family, entitled "A Chronicle of the China Trade; the Records of Augustine Heard & Co., 1840-1877". 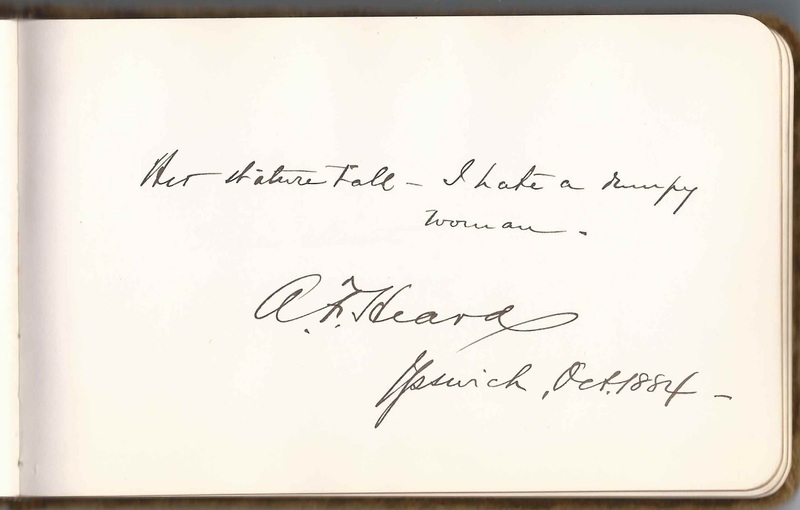 The A. F. Heard who signed a page at Ipswich, Massachusetts, in July 1884 and cited Byron's "Don Juan" was presumably Albert Farley Heard, who worked in the China trade with his uncle Augustine Heard; acted as a liaison between Russia and China for a number of years; was secretary to fellow Massachusetts native William Crowninshield Endicott, who was then War Secretary under Grover Cleveland; and, finally, served as the U.S. Army Librarian. Read more about Albert Farley Heard here - scroll down a bit and you'll find two paragraphs on him, as well as a photograph. And read "Poisoning by Wholesale: a Reminiscence of China Life", by Albert Farley Heard, here, transcribed by Robert M. Gray from papers found in the Augustine Heard collection. Another resource online with Heard family information is "Amy Heard, Letters from the Gilded Age", transcribed, translated and edited by Robert M. Gray in 2005. I believe the Max Heard who signed a page in Elsie's album on June 23, 1883, was Amy's sister Helen Maxima Heard, "Max", who is mentioned frequently throughout; there's even a photograph. Max would later marry Max von Brandt, German Plenipotentiary to Japan 1860-1875 and to China 1875-1893. See a robe here that belonged to either Max or her sister Amy. Baltimore, Maryland, was represented by the Gilman family, four of whom signed pages in March of 1882, and by George Leeds. Daniel Coit Gilman, first president of Johns Hopkins University, and his second wife Elizabeth Dwight (Woolsey) Gilman shared a page. Daniel's daughters Lizzie and Alice, whose mother was Daniel's first wife Mary Van Winker (Ketcham) Gilman, signed individual pages. 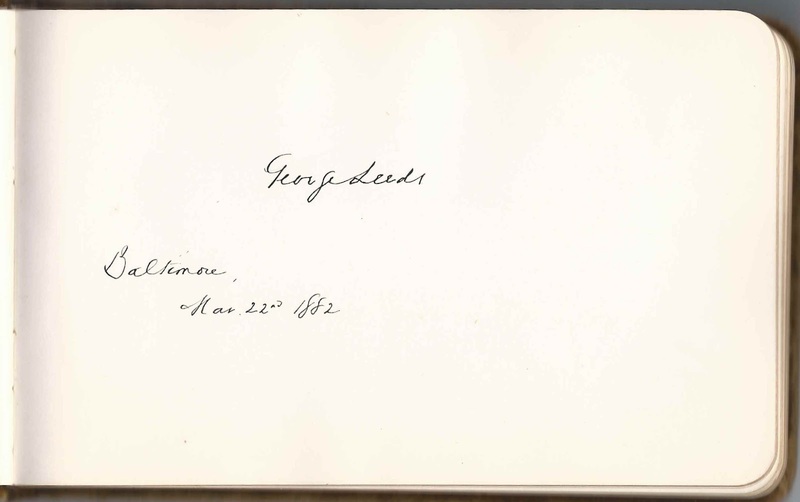 George Leeds signed his page at Baltimore, Maryland, on March 22, 1882. Refer to the list below for more people with Leeds in their name. Other names with a relationship to the Appleton and Heard families are Fuller, Thayer and Tuckerman; again, refer to the list below. If you have a theory as to Elsie's identity or information on any of the signers listed below, please leave a comment or contact me directly. Thanks! Eleanor Brooks, written at Ipswich, Massachusetts, on a visit on January 29, 1883. Perhaps the Eleanor Brooks who was the future wife of Richard Middlecott Saltonstall. Phillips Brooks, signed on March 3, 1882; perhaps the same Phillips Brooks who signed another page; presumably the same Phillips Brooks who signed another page. 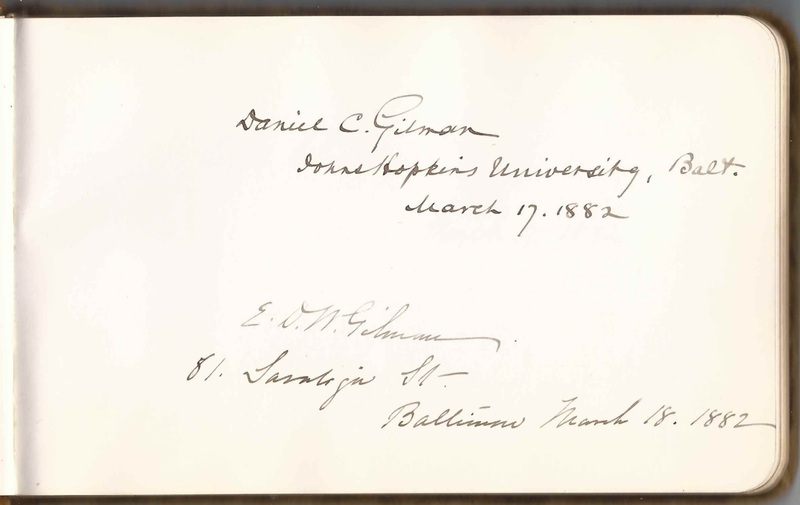 Daniel C. Gilman, Johns Hopkins University, Baltimore, Maryland, on March 17, 1882; shared the page with his wife E. D. W. Gilman. He was the Daniel Coit Gilman, first president of Johns Hopkins University. E. D. W. Gilman of 81 Saratoga Street, Baltimore, Maryland, signed on March 18, 1882; shared the page with her husband Daniel Coit Gilman. She was Daniel's second wife Elizabeth Dwight (Woolsey) Gilman, whom he married in 1877; his previous wife, Mary Van Winker (Ketcham) Gilman, died in 1869. Lizzie Gilman, signed on March 17, 1882. She was Elizabeth Gilman, daughter of signer Daniel Coit Gilman and his first wife Mary Van Winker (Ketcham) Gilman, who died in 1869. Alice Gilman, signed on March 17, 1882; daughter of signer Daniel Coit Gilman and his first wife Mary Van Winker (Ketcham) Gilman, who died in 1869. 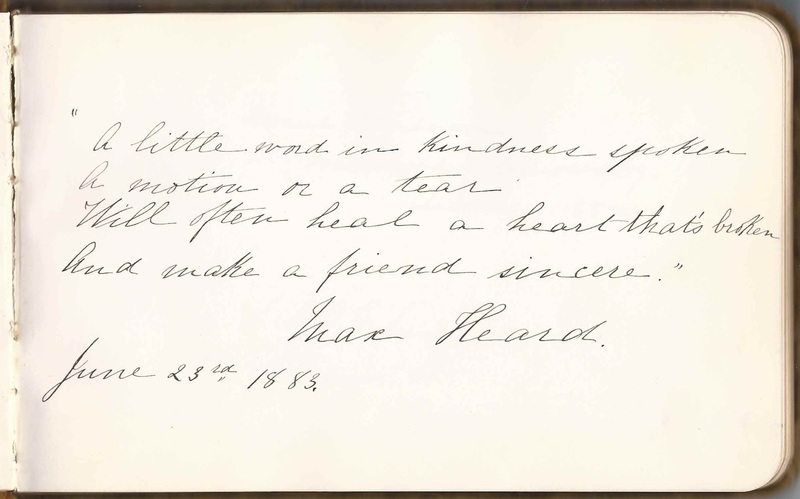 A. F. Heard, signed at Ipswich, Massachusetts, in October 1884. He quoted Byron's "Don Juan": "Her stature tall - I hate a dumpy woman". Presumably Albert Farley Heard (1833-1890), nephew of Augustine Heard, who founded the firm AHC, which traded with China; Albert joined the firm; later served as a Consul for Russia in Shanghai and as a representative for China in Russia; finally, as secretary to William C. Endicott, Secretary of War, under Grover Cleveland, and as Army Librarian. Reuben Kidner, signed on March 29, 1882; perhaps Rev. Reuben Kidner, a native of England and resident of Boston, Massachusetts. 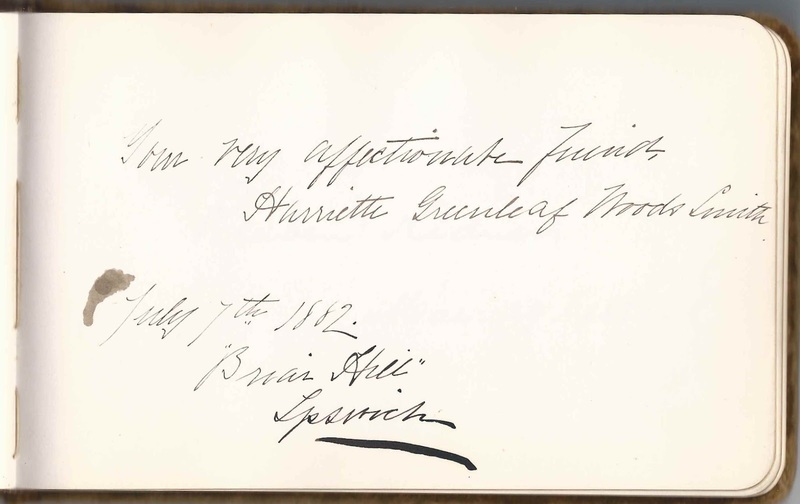 Harriette Greenleaf Woods Smith, signed on July 7, 18832 at Briar Hill, Ipswich, Massachusetts; she signed another page as well. She was the daughter of Rev. John Cotton Smith and Harriet Hooper (Appleton) Smith. 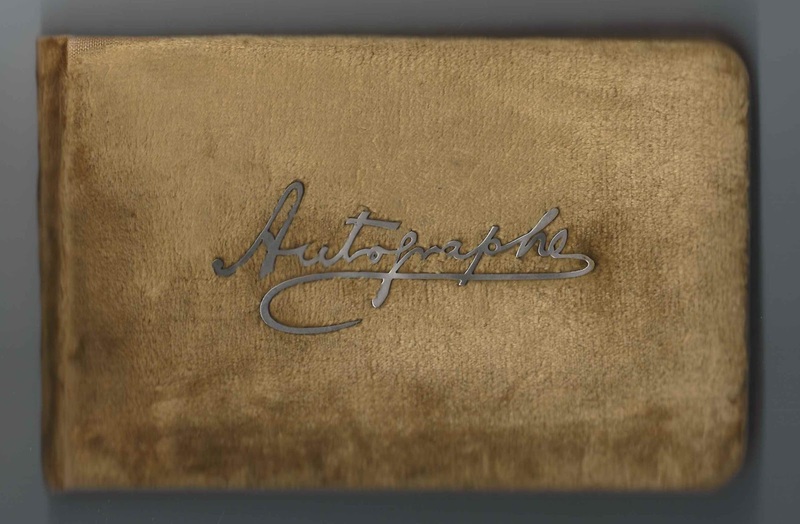 Ruth Appleton Tuckerman, signed at Ipswich, Massachusetts, on October 4, 1883; shared the page with her husband Charles Sanders Tuckerman. They were Ruth (Appleton) Tuckerman and her husband Charles Sanders Tuckerman. Is the signer Anne Osgood Tuckerman a descendant of Salem Witch Mary Osgood Clement ??? Hopefully a reader will happen by with an answer! But it would be interesting, for sure!